"Why would I ever want to wear someone else’s smelly old clothes?” has always been my general approach to vintage shopping. And let’s be honest, vintage shops do smell funny so it’s not an unreasonable question to ponder over. The thought of wearing an item that someone else has potentially sweated on, farted in and who knows whatever else makes my skin itch. So no matter how cool people suggested it was, I had made my mind up - vintage shopping was not for me! But then all of a sudden it was. I began testing out the 'old is the new new' waters in York (who would have guessed! ), where I spotted someone wearing an awesome Fila jumper and became obsessed with getting my hands on it. When I found out it was actually a vintage buy, I was gobsmacked. It looked in good condition, it didn’t give off a weird odour, no coffee stains anywhere and was purchased in the city. What was this magic? The scientist (read shoppaholic) in me needed to find out whether more existed. A small flame had been lit and while I didn’t end of buying anything from that thrift shop, I did let vintage clothing touch my body - trying on a couple of pieces - and you know what, I wasn’t repulsed so a good start. 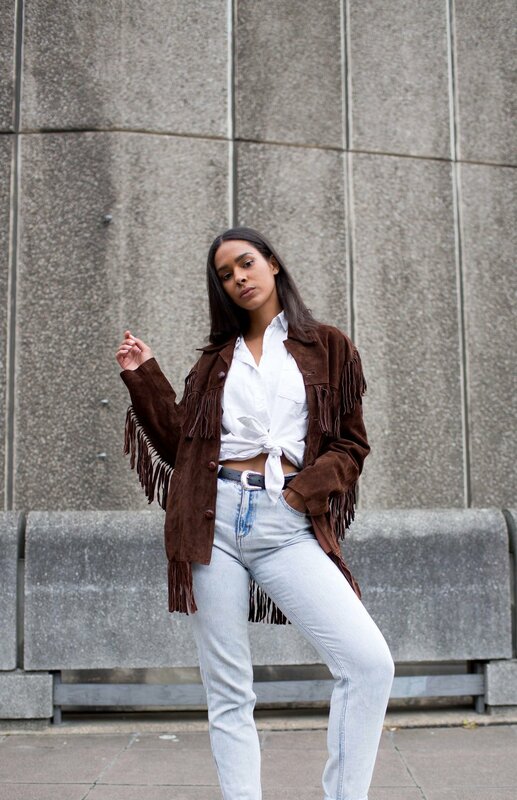 Further into the year, I began to notice new friends boasting about buying old Levi jeans for as little as £5 and extended family attributing their standout sense of style to vintage pieces. I finally became a convert in America, because if there was ever the ideal place to properly thrift shop, it’s for sure in San Francisco. They have whole streets dedicated to the stuff, lined with every fashion style you can imagine: old military berets, classic pin up dresses, retro sports gear - you name it, they got it! Within 15 minutes of entering a shop, I grabbed a real cowboy hat, an all in one denim jumpsuit and the best quality boater hat I’ve ever laid eyes on. Winning! Rocking my new (or rather old) items, I’d repeatedly get asked about their labels and nothing gave me greater pleasure than to smugly declare them as one of a kind. I felt unique, which in the fast-fashion world of today is really unique. Then back in London, I got booked as a model for an uber cool thrift shop in Brick Lane called Blitz, where I happened to purchase this stunner of a jacket (if you’re ever that way, check it out - you won’t be disappointed). So now I'm hooked! Moral of the story is to not to be afraid when it comes to experimenting with your style. I assumed the vintage world wasn’t for me but as someone who favours style over trends, I found smart vintage shopping as the perfect way to be different in my fashion choices. And yeh, I won’t lie to you, sometimes the clothes do smell - mostly of old, dusty cupboards - but nothing one (or three) good washes won’t sort out. Plus it’s ethical to rewear old clothes, so you’d be doing your bit to help the planet (the word hero springs to mind). Just please don’t forget to check the pits for any serious sweat damage!